Salt Lake County • Dem says he attracted many moderate Republicans as wellas independents. 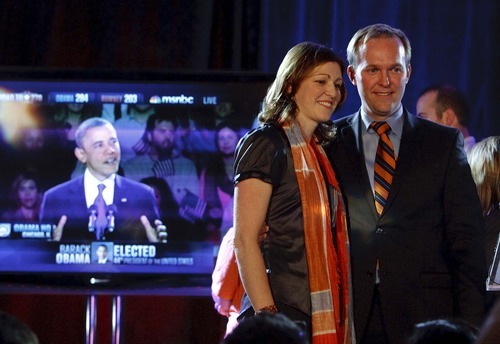 Leah Hogsten | The Salt Lake Tribune Salt Lake County Mayoral candidate Ben McAdams stops his acceptance speech with his wife Julie so the crowd could listen to Barak Obama's acceptance speech at the Utah Democratic Party headquarters at Salt Lake Sheraton Hotel Tuesday, November 6, 2012. 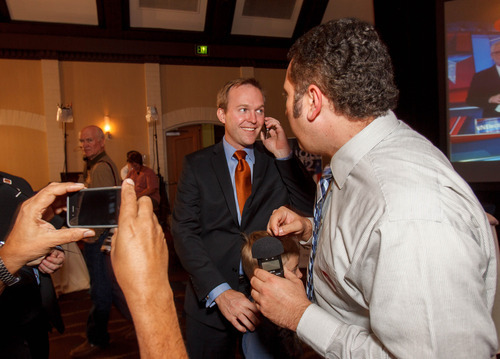 Trent Nelson | The Salt Lake Tribune Salt Lake County mayoral candidate Ben McAdams fields a phone call at the Salt Lake Sheraton Hotel, Democratic headquarters on election night Tuesday, Nov. 6, 2012, in Salt Lake City. 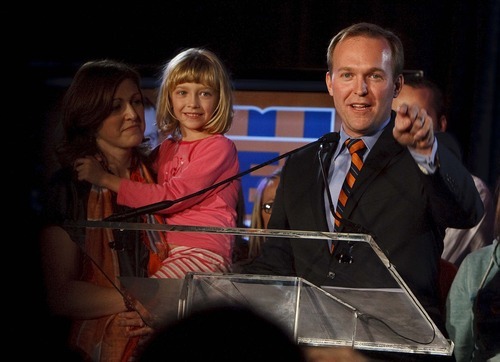 Leah Hogsten | The Salt Lake Tribune Salt Lake County Mayoral candidate Ben McAdams during his acceptance speech with his wife Julie, holding daughter Kate at the Utah Democratic Party headquarters at Salt Lake Sheraton Hotel Tuesday, November 6, 2012. Trent Nelson | The Salt Lake Tribune Salt Lake County mayor candidate Ben McAdams makes his victory speech at the Salt Lake Sheraton Hotel, Democratic headquarters on election night Tuesday, Nov. 6, 2012, in Salt Lake City. McAdams' wife Julie, at left, is holding their daughter Kate. Trent Nelson | The Salt Lake Tribune Salt Lake County Mayor candidate Ben McAdams makes his victory speech at the Salt Lake Sheraton Hotel, Democratic headquarters on election night Tuesday, Nov. 6, 2012, in Salt Lake City. McAdams' wife Julie, at left, is holding their daughter Kate. 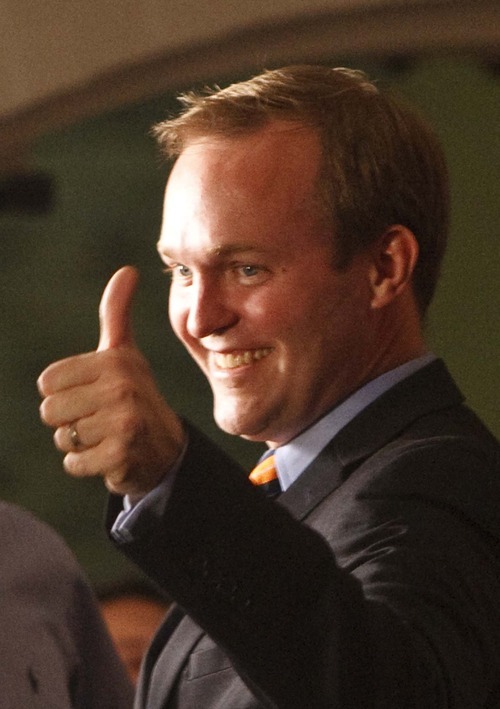 Leah Hogsten | The Salt Lake Tribune Salt Lake County Mayoral candidate Ben McAdams is thumbs up as election results trickle in at the Utah Democratic Party headquarters at Salt Lake Sheraton Hotel Tuesday, November 6, 2012. Steve Griffin | The Salt Lake Tribune Salt Lake County mayor candidate, Mark Crockett, smiles as he talks to television reporters during election night party for the Republicans at the Hilton Hotel in Salt Lake City, Utah Tuesday November 6, 2012. Trent Nelson | The Salt Lake Tribune Salt Lake County mayoral candidate Ben McAdams at the Salt Lake Sheraton Hotel, Democratic headquarters on election night Tuesday, Nov. 6, 2012, in Salt Lake City. 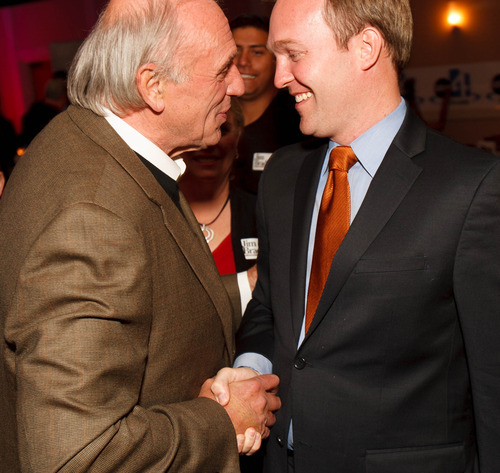 Trent Nelson | The Salt Lake Tribune Salt Lake County Councilman Jim Bradley, left, and Salt Lake County mayoral candidate Ben McAdams shake hands at the Salt Lake Sheraton Hotel, Democratic headquarters on election night Tuesday, Nov. 6, 2012, in Salt Lake City. Trent Nelson | The Salt Lake Tribune Salt Lake County mayoral candidate Ben McAdams at the Salt Lake Sheraton Hotel, Democratic headquarters on election night Tuesday, Nov. 6, 2012, in Salt Lake City. 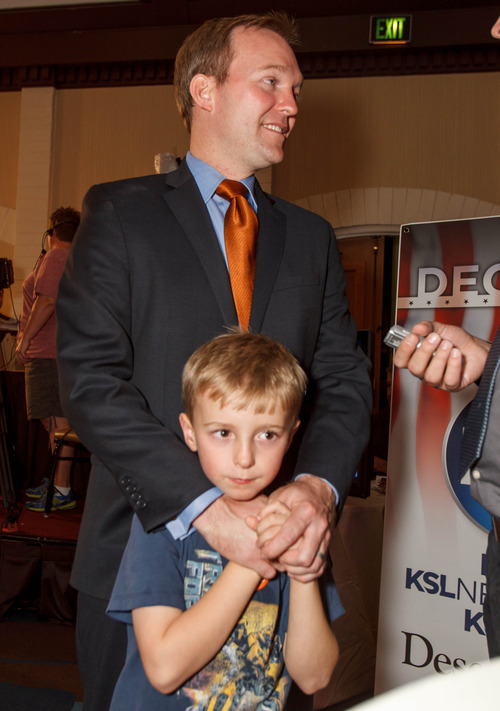 Trent Nelson | The Salt Lake Tribune Salt Lake County mayoral candidate Ben McAdams with his son James at the Salt Lake Sheraton Hotel, Democratic headquarters on election night Tuesday, Nov. 6, 2012, in Salt Lake City. 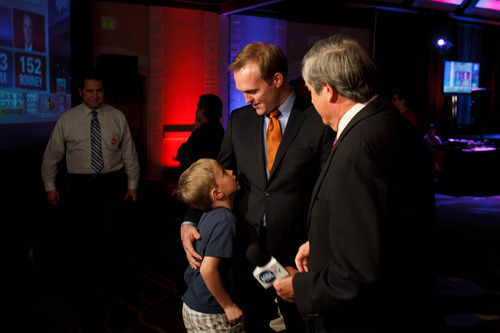 Trent Nelson | The Salt Lake Tribune Salt Lake County mayoral candidate Ben McAdams with his son James at the Salt Lake Sheraton Hotel, Democratic headquarters on election night Tuesday, Nov. 6, 2012, in Salt Lake City. The Democrats still are in charge in Salt Lake County. 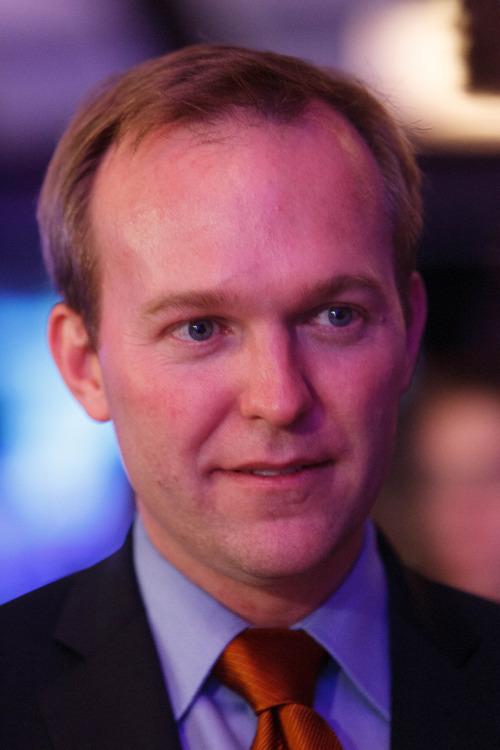 Ben McAdams built an early lead and held it throughout the night, defeating Republican Mark Crockett in the race for Salt Lake County mayor. 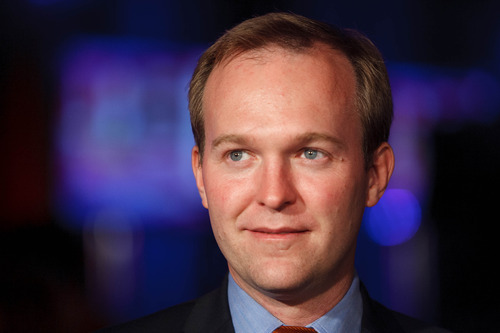 According to unofficial returns Tuesday, the 37-year-old McAdams secured almost 55 percent of the vote in fulfilling his quest to replace Democrat Peter Corroon as mayor of the county and its $800 million budget, the state&apos;s second largest. Crockett, a Holladay businessman and former county councilman, conceded in a tweet to McAdams about 11:30 p.m. when about 84 percent of the vote was counted. "It looks like we&apos;re going to lose," he told The Tribune about the same time. "We&apos;re done." A state senator and adviser to Salt Lake City Mayor Ralph Becker, McAdams sported a big smile as he climbed to the podium at the Democrats&apos; election party at the Sheraton Hotel as a song  "Everything is going to be alright"  by the alt-rock group Yellowcard boomed over the PA system. "Together, we will lead Salt Lake County to a bright and prosperous future," said the mayor-elect. "We are just getting started." 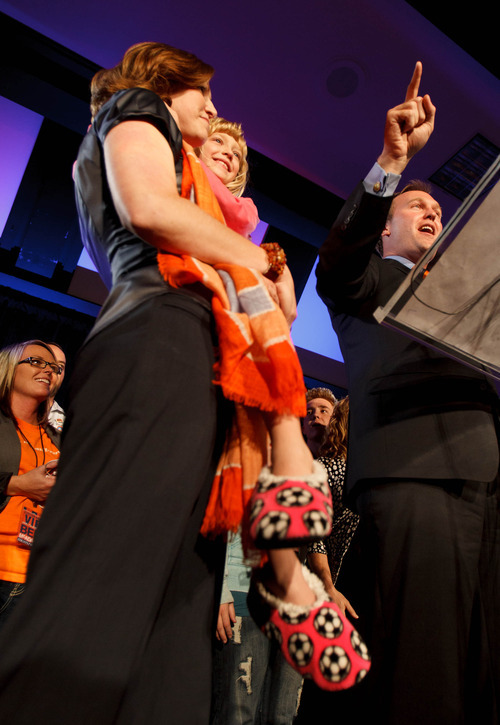 McAdams campaigned on the theme that "he&apos;s different," a Mormon Democrat who had developed a reputation of being able to work with legislators on both sides of the political aisle during his tenure as a state senator. He also maintained he had a better temperament for the job than Crockett, who had a reputation for being difficult to work with during his four-year council stint (2005-2008), especially since many of the county mayor&apos;s duties involve working closely with mayors of the valley&apos;s 17 cities. His campaign commercials focused on the "Ben Bus," which showed McAdams driving a school bus, picking up many of the 13 valley mayors who endorsed him for county mayor. Crockett, the 46-year-old director of Vici Capital Partners, contended he was well-suited to running the county because of his business experience helping large corporations and government agencies cut expenses through re-examinations of their operational practices. Applying those same business principles to county government, Crockett said he could free up enough revenue to help the county provide vital human services without raising taxes. McAdams raised considerably more money in his campaign than Crockett  $830,000 to $468,000  taking to the airwaves in hopes of adding independents to his traditional Democratic base. 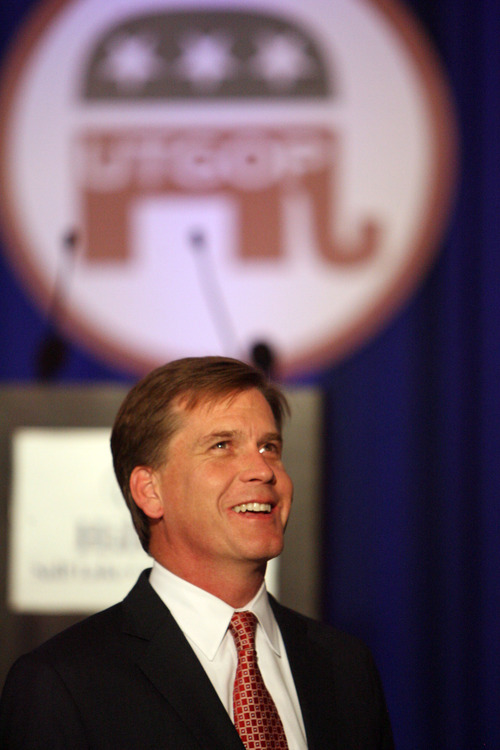 Crockett relied largely on mailers to carry his message to voters, but also was counting heavily on receiving extra support from conservatives drawn to the polls because Mitt Romney, a Mormon and popular leader of Salt Lake City&apos;s successful 2002 Winter Olympics, was atop the Republican ticket. But McAdams contended his campaign benefited from the high turnout at the polls, and that he attracted many moderate Republicans as well as independents. Days before the election, his internal poll showed that almost 22 percent of voters who identified themselves as belonging to the GOP were going to vote for him. He attributed part of that to his record as a fiscal conservative in the Legislature. State Democratic Party Chairman Jim Dabakis announced after McAdams&apos; win that he is putting in his name to fill McAdams&apos; state Senate seat. Reporters Judy Fahys and Aaron Falk contributed to this story.